GardenerScott | A gardening blog for everyone. GardenerScott A gardening blog for everyone. Gardening is a mindset that doesn’t require soil or seeds to develop. Anyone who enjoys the exquisite taste of an heirloom tomato fresh from the garden has the innate ability to be a gardener. If you like to smell roses, or lilacs, or honeysuckle, you have the makings of a gardener. If you like vegetables of any kind, gardening may be in your blood. Even if you don’t like vegetables at all you are ripe for becoming a gardener. Essentially, gardening is for everyone. Gardening is one of the few things in life where you have complete control over why you do it, when you do it, where you do it, and how you do it. And after you’ve done it you have something to show for your labors. Successful or not, you have accomplished something unique. At this point, many people counter with their lack of a green thumb or even the possession of a black one. My counterpoint is that I have killed more plants than many gardeners will ever grow. I gardened for decades before becoming a master gardener. At that point I learned of the many things I had done wrong for so long. But that hasn’t stopped the devastation. With increased confidence I planted, and killed, many more plants. I continue to make mistakes in gardening. It’s part of the process. Sure, I would prefer to always be successful and never cause a plant pain or death, but gardening is not just about success. It is about partaking in an activity that has been proven to enhance the enjoyment of life and even prolong it. Gardening is good for you. Too many people think that to be a gardener they must have a plot of land dedicated to a time-consuming activity. Nothing can be further from the truth. A single pot on your patio with a live plant in it makes you a gardener. If that single plant is a tomato or pepper, you are a vegetable gardener. If it is a marigold or daisy, you are a flower gardener. If it is basil or thyme, you are an herb gardener. If you have a plum tree in your yard and harvest the fruit, you have a mini orchard and are a fruit gardener. Once you’ve acknowledged that you’re probably a gardener at heart, by thought or through demonstration of what you grow, you can begin to expand your gardening knowledge and think about adding more plants to your repertoire. If you already have that plot and are growing a vegetable, herb, or flower garden, think about what you can do to grow and experience more. Winter is a great time to think about your gardening plans for the year. Consider adding another pot on your patio, or taking out some lawn and adding a vegetable bed, or venturing into the addition of fruit trees. Spend indoor time during the cold months researching and learning. Talk to the people you know who you consider to be gardeners and ask them for advice on how to begin. When done with the foundation of a little knowledge, gardening takes less time than most of your everyday activities but can be far more rewarding. Extra time and effort can lead to ample enjoyment and satisfaction. And at the end of the day you can call yourself a gardener. For the last two years I have been gardening on a full-time basis for a phenomenal school garden project. As a result, my blog postings have suffered. I plan to rectify that by sharing of our adventures in gardens that are planted by and for children. I call myself a gardener and am sharing that mindset with a new generation. I look forward to the days when these students call themselves gardeners. A deer-proof garden is essentially non-existent, but a highly deer-resistant garden is attainable with a little effort and planning. One key is to practice “camouflage gardening“. Camouflage gardening is the practice of using plants that animals don’t like to deter them from eating plants that they do like. Camouflage gardening is mostly focused on deterring deer, but can work for rabbits, squirrels, and even dogs and cats with appropriate plantings. I must point out and stress that this deters animals like deer from eating desirable plants, it doesn’t prevent them from eating anything. Think of it as constructing a castle or defensive military position. The plant you want to protect is in the center of the defensive zone. It’s surrounded by a barrier of deer-resistant plants. For superior defense you layer zones with additional rings of protection. You’re not building walls to protect plants but using plants to protect plants. There are certain plants that deer, and similarly many other animals, don’t like. Deer tend to avoid plants that are strongly aromatic or bitter tasting, that have a milky or sticky sap, or that have prickly leaves or are tough and hairy. When they encounter these plants they tend to ignore them and move on. Deer are browsers that amble from plant to plant looking for something they like. If a plant isn’t on their list of favorites, they’ll keep looking for one that is. This assumes that they have an adequate food selection available. When conditions are bad, as in drought years or when habitat is reduced, they’ll eat almost anything to stay alive. In spring pregnant does will eat almost anything. To get the best protection and to help minimize problems during bad years, the outside protective zone, which is the first that deer encounter, would have a plant that is highly resistant to deer. This layer should have plants that are aromatic with an odor that makes them walk away. You create a scent barrier that prevents them from smelling desirable plants. Lavender, mint, salvia, beebalm, rosemary, and cedar are some plants that have a smell deer avoid and are also rarely eaten. The second layer of protection would include bad-tasting or toxic plants. The idea is that if they wander past or through the first protective zone they’ll come across plants that they don’t want to eat. Holly, juniper, feathergrass, zinnia, and barberry are rarely eaten. Plants like elderberry, poppies, bleeding heart, lobelia, and larkspur can be toxic. When deer encounter these plants they should go in the opposite direction. A third layer of protection is to offer a suicide zone. This is a grouping of fast-growing plants outside the protected area that are less deer resistant. Honeysuckle, trumpet creeper, morning glory, and clematis are plants that deer will nibble without decimating the plant. Flowers that reseed prolifically fit in here too. Planted strategically, these plants can lead deer away from more desirable beds. 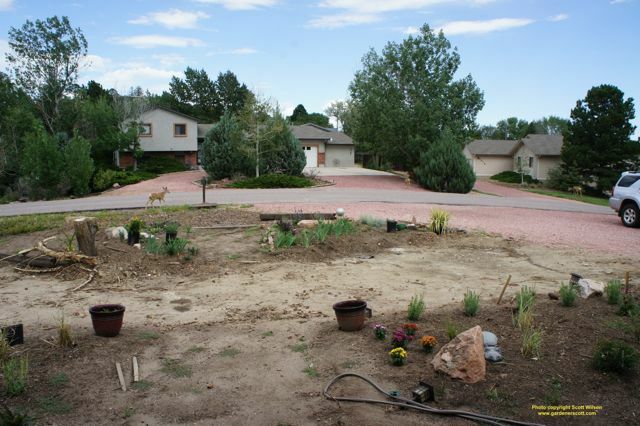 With a simple two-stage protection planting plan, deer will come across your landscape, realize they don’t like the smells and tastes, and keep on walking. If they’re curious or extra hungry, they’ll try nibbling on what they find but if they don’t like it they’ll realize this whole yard isn’t worth their time and effort and will move on to your neighbor’s yard. They never make it to the roses or tulips or young fruit tree that they would devour. Adding a suicide zone gives them someplace else to go as they walk away from your garden. They may eat a few clematis or morning glory flowers as they avoid the aromas and tastes of the other zones. Asters, petunias, and small sunflowers give them something else to nibble, and will grow back soon. As you plan a camouflage garden you don’t need to think in terms of clearly defined rings of plants. The first and second protective zones can be intermingled, with aromatic plants planted among bitter and toxic ones. The concept is that one plant deters the deer and when they move to a second plant it deters them too. Ideally every plant they encounter within a defined space is a deterrent and they never move through it. When you have a mix of plants with many deer deterrent properties it creates a synergy where the entire garden becomes highly effective at deterring deer. A wide spectrum of aromatic plants can confuse deer to the point that they seek a more simple, clearly identifiable source of food… like the big expanse of tulips down the street. To be most effective camouflage gardening needs to be as year-round as possible. If the plant you’re hoping to protect blooms or buds before the others, deer can find it. Your deterrent plants need to be in position and producing their deterring effect. For example, for early spring your garden border is planted with dwarf juniper, rosemary, sage, or artemisia — plants that are still fragrant even when they’re dormant. A fragrant groundcover like thyme covers the area. A large planting of daffodils, plants deer typically don’t eat, brings early color and helps create another deer deterrent barrier. 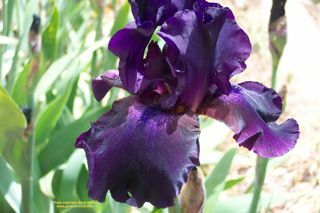 Irises come next, another plant deer typically don’t eat. At the center of your display for height and color are your tulips, a plant that deer love to devour. Depending on variety, you may have irises and tulips flowering together which adds extra confusion to the deer. It’s not a perfect solution. In a good year your tulips are spared; in a very bad year everything is eaten. I’m planting my new landscape with entire beds of deterrent plants. One bed has lavender on one side and various spirea on the other. Miscanthus grass provides height and interest. Purple coneflower and yarrow add color. Apache plume fills the center for added texture color and interest. It’s highly satisfying to see deer tracks in and around the bed and not a single plant is disturbed. Another bed has creeping phlox, artemisia, dwarf pines, salvia, yucca, columbines, irises, and daffodils; again, there are tracks but no damage. Next year’s new beds will have similar plantings. We have a resident deer population. They even bed down among the gambel oak trees in our backyard. I’m hoping that they’ll get used to encountering so many plants they don’t like that by the time I plant young trees and a few other less-resistant perennials they’ll have learned to go some place else for breakfast, lunch, and dinner. Already I’ve noticed more tracks walking around my deer-resistant beds than walking through them. For your camouflage garden, research deer deterrent plants. You won’t need to sacrifice color, smell, texture, or height. Select plants that you like to grow normally. Then design your beds and landscape with those plants as the first barrier. 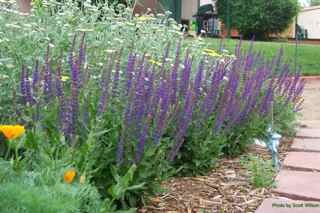 Continue with plantings of other deer-resistant plants that you want in your landscape. Personalize the space. You don’t need to grow plants you don’t like. Camouflage gardening isn’t foolproof. The only sure way to protect plants is with a physical barrier. 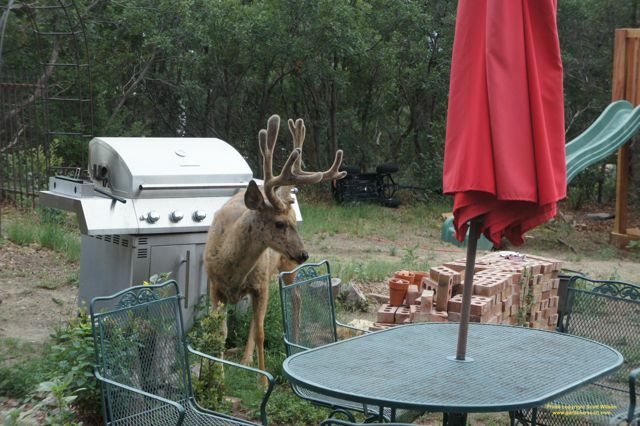 For prized plants and young trees a fence or metal wall is the only sure deer proofing. 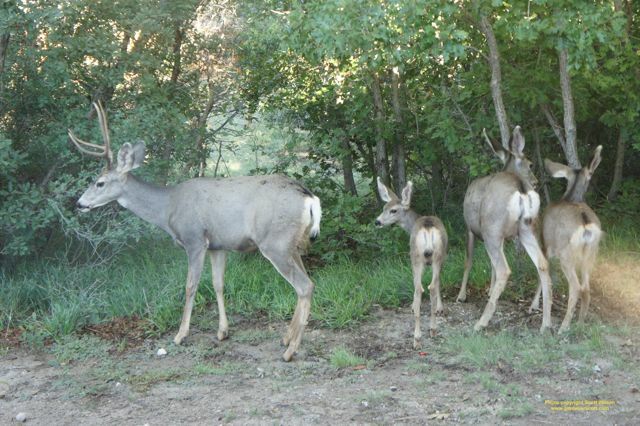 Used together, camouflage and wire fences can allow plants that deer like to eat to become large enough and established to the point they don’t need a fence. Camouflage gardening works best in a large landscape or garden with enough space to allow planting the necessary barrier plants, but even in small gardens the same principles can be beneficial. 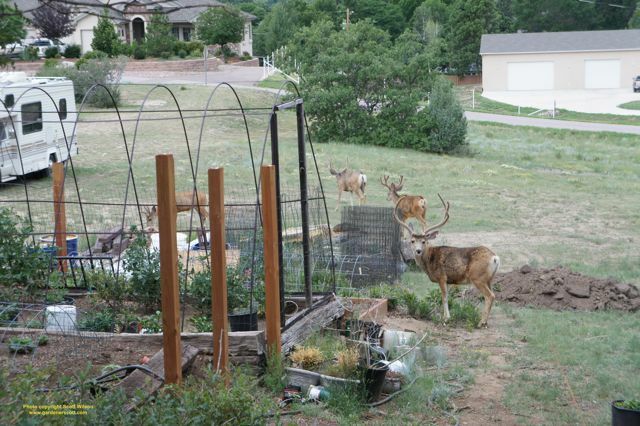 Make plants that deer and other animals avoid your first line of defense. Hide your other plants with smells and tastes that deter deer. With a little planning and a lot of luck you may be able to enjoy plants that you’ve had problems with before. Though they bloom in spring, flower bulbs that are planted in fall are known as “fall bulbs”. Popular spring-flowering plants like daffodils, tulips, crocus, and hyacinth are fall bulbs. Allium, scilla, anemones, and Asiatic lilies are planted in fall too. With a seasonal range of three months, when to plant fall bulbs is a question many gardeners struggle with. Timely fall planting allows roots to develop before the ground freezes and prepares the plant for quick spring growth and flowering. If you plant too early the bulbs may use critical energy reserves and can begin to send up new shoots, exposing the young growth to winter kill. Prolonged exposure to warm, moist soil may promote fungal problems and rot. Plant too late and root growth may not be enough for the plant to flower properly. To flower in spring, fall bulbs require exposure to cold temperatures. This chilling period triggers them to break dormancy when temperatures warm in spring. It’s all about planting early and warm enough for the bulbs to begin developing, but late enough for them to stop developing shortly after to start soaking in the cold. There is no single right time for all gardeners. The proper time for planting fall bulbs may be September in Wyoming or North Dakota, October in Colorado or Kansas, November in Oregon or Nevada, and December in Virginia or North Carolina. Gardeners need to find out what’s right for their individual gardens; one-size-fits-all advice from gardening books or magazines may lead to incorrect guidance. Cooler soil temperatures are a primary indicator for proper planting time. Ideally, soil temperature needs to be below 60F; a temperature of 55F degrees is perfect. 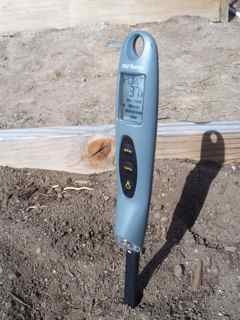 The problem for the average gardener is that few gardens come with soil thermometers. As a guideline, soil temperatures usually cool to this target after a few weeks of nighttime temperatures regularly between 40 and 50. These suggestions are very unscientific and rely on local conditions that may not match your climate. But if you find a natural indicator that works for you, use it. Some gardening experts recommend planting bulbs six weeks before a hard, ground-freezing frost. That’s a little too hard to predict for many regions. If unseasonal warm weather lingers, bulbs may end up waiting in the ground for the cold to arrive for two months or more. That’s much too early. Planting within a few days of your average first frost date is a good guideline. That’s what I typically use. The average first frost date means that historically half of first frosts occur before that date and half occur after. For me, that’s the first week of October. By that time cool nights have cooled the soil but there are still enough warm days ahead to keep the soil warm enough for root development. Check with local gardening experts for recommendations on planting fall bulbs. Diane Brunjes, Certified Colorado Gardener and the gardener for the Horticultural Art Society of Colorado Springs, recommends October planting versus September for our area too. In our climate, “It’s too warm early in the season,” she says. She’s right. A little too late is usually better than a little too early. There is a four to six-week target window for planting bulbs, but as long as you can still work in the soil it’s probably not too late. Crocus, scilla, and snow drops do better planted earlier. 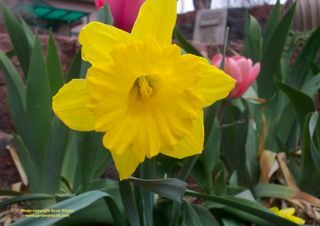 Daffodils, hyacinth, and tulips can handle late planting. 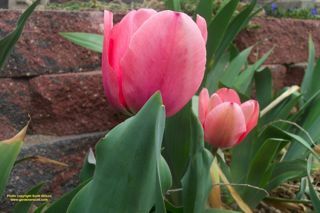 In fact, tulips can be planted in frozen ground and will probably still do fine. If you miss the ideal planting time and still have bulbs you purchased, plant them anyway. Most bulbs will dry out and be worthless if left to sit in their bag over the winter. They stand a chance of growing while in the ground. Plant them and hope for the best; you may be surprised by the results. If you’re still wondering when to plant your bulbs take a look around your garden. When you walk outside at night are you cold without a jacket? Have your pepper and tomato plants withered from frost? Are your raspberries fruiting? Are mum flowers drying on the plant? These are all signs that the season is changing and winter is coming. Don’t delay too long. It may be the perfect time to put those bulbs in the ground. What are AHS Plant Heat Zones? They’re the counterpart to USDA Plant Hardiness Zones. USDA Plant Hardiness Zones are based on average cold temperatures of winter and the AHS Plant Heat Zones are based on average hot temperatures of summer. Hardiness Zones help gardeners determine if a plant can survive their region’s winter extreme temperatures while Heat Zones help determine if a plant can survive their summer extreme temperatures. The American Horticultural Society coordinated with the same people who helped develop the USDA Hardiness Zone map to develop a Heat Zone map based on temperature data from the National Climactic Data Center. Daily high temperatures from National Weather Service stations throughout the United States were compiled for the years 1974 through 1995. In 1997 they produced a national map representing their findings. The result is a map that color codes the country into 12 zones that indicate the average number of days when the temperature is above 86F degrees (30C). These are “heat days”. Zone 1 has an average of less than one day per year above 86 degrees while Zone 12 has an average of more than 210 days above 86 degrees. Why 86F (30C) degrees? That is the point that many plants begin to experience distress and potential damage from sustained heat. Above this point plants can drop blossoms, drop leaves, fade in color, reduce fruit development, and possibly die. Some plants won’t die right away but will be stressed for so long that each year they perform less productively than the year before. Many plants will wilt in heat, but will recover once temperatures fall. Sustained heat can have a serious physiological impact on some plants and triggers a lingering decline to ultimate death. Knowing how a plant will handle hot days is the reason for the AHS Heat Zone Map. Most gardeners are familiar with the USDA Hardiness Zone system and look for the number on a plant tag when selecting new plantings. I live in Zone 5 and always make sure new perennial plants are at least hardy down to -20F degrees that the zone represents. I prefer plants hardy to Zone 4 for the occasional extremely low temperatures we get that approach -30F in winter. I’m in AHS Plant Heat Zone 5. That represents 30 to 45 days above 86F degrees. I prefer to select plants for at least Zone 6 for the recent hot summers we’ve had; Zone 6 allows for 45 to 60 days above 86F. This year we’re definitely encroaching on Zone 6 heat days. Plant growers and distributors that include AHS Plant Heat Zones on tags will list both zone ranges. You’ll now find a listing like “3-9, 6-1”. That means the plant is suitable for USDA Hardiness Zones 3 through 9 and is suitable for AHS Heat Zones 6 through 1. Many plant catalogs are also including this information in their plant descriptions. For me, an ideal plant would be something like “4-9, 7-1”. That means it can handle the cold of the Hardiness Zone 4 and the heat of Heat Zone 7. My garden is well within both ranges and the plant should do well. There are some limitations with the AHS Heat Zone map. Because it is relatively new and unknown, there aren’t many resources available to make it easy for you to identify your zone. You have to try and determine exactly where your city falls within the zones on the national map. Apparently the AHS had a tool for determining exact locations, but the zone finder application is nowhere to be found now. I haven’t been able to find any other source for finding Heat Zones by zip code like the USDA map has. Over 15,000 plants have been coded for heat tolerance. As more plants are coded and more companies begin listing both USDA and AHS zones on plant information, you can expect more gardeners to become familiar and comfortable with the conversion to a two-zone system. For many of us we choose our plants, put them in our gardens, and then see how they do. For various reasons some plants do well while others struggle. Using both zone maps for selecting plants can help us put in plants that will not only grow well, but will thrive. If some of your plants didn’t do well in summer it may be because they weren’t able to tolerate your garden’s hot days. That may be an indication that they’re inappropriate for your region. Understanding and using the AHS Heat Zones can help prevent similar problems in the future. Two harvests in the same growing season are easy to accomplish. Many gardeners sow and plant in spring, spend summer tending to their crops, harvest in early fall, and then wrap it all up and wait until spring to repeat the same process. With little effort you can double your garden’s output with sow, tend, sow, harvest, tend, and then harvest again. Then you can spend winter satisfied that your garden played double duty to produce all it could. In late summer you sow seeds for cool season plants that will grow as temperatures begin to decline. They’ll be ready to harvest after the first frosts have appeared and long after the last tomatoes were pulled from the vines. There is no need to create new gardens; you use the same beds you do now. Many gardeners grow these plants in spring and hope for a slow start to summer so the plants will mature and be ready for harvest before high heat causes them to bolt and their taste turns bitter. We take advantage of their natural ability to tolerate low temperatures by planting early. We can also use that ability to plant late. The mature plant tolerates the low temperatures of fall, there is no risk of bolting, and many people believe many of these crops taste superior after exposure to frost. Those of us who sow in early spring and hope the soil has warmed enough to initiate germination are ready for a percentage of our seeds to never grow. Those of us who sow in late summer are pleased that the warm soil provides speedy germination with little seed loss. Early seed and plant care is different when you plant late. In spring there is less need for extra watering; lower temperatures mean less evaporation and there is always a chance of rain or late snow. In summer, the heat requires more gardener attention to maintaining moist soil conditions for seeds and young plants; you may need to mist or water the plants two or three times a day in harsh sun. Temperatures above 80F (27C) will cause broccoli and spinach to bolt quickly. Sowing in a shady spot or setting up a row cover can reduce this concern. Once the plants have a few sets of leaves the need for watering becomes less than in late summer. While early plants need more water to combat the increasing summer heat, later plants require less water as the decreasing temperatures bring comfort. The plants are less stressed in fall. They grow in the conditions they like best; they’re called cool season plants for a reason. As long as the day temperatures remain about 10 to 15 degrees above freezing (40F – 50F, 4C – 10C) you can expect the crops to continue growing and producing. When the day temps remain below 40F (4C) the plants may begin to suffer. Careful harvesting will still produce results. The center of the plant may still have new, tasty leaves while the exterior leaves look frazzled. Hard freezes, cold days, and icy conditions will adversely affect most cool season crops and will spell the end for your second harvest, but you can delay winter by mulching heavily with straw and using a season extender like cold frames, cloches, or plastic tunnels. I use my hoophouse system to harvest well into November and even December. Some crops like cabbage, kale, and spinach can do well, even in snow. 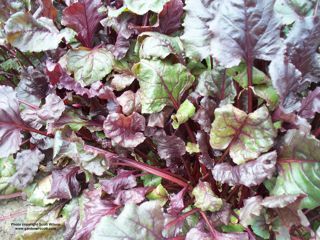 With heavy mulching, beets, leeks, and parsnips can often be overwintered and harvested in spring (I’ve done this). Use your entire vegetable garden for fall planting. If you have a cool-season spring bed for broccoli, spinach, or lettuce and then let that bed remain filled with bolty, straggly, dried plants throughout the summer, rip those plants out and sow again for a fall crop. Your tomatoes, peppers, and melons will decline in cooling weather. Anticipate their decline and sow seeds among those plants, in the same beds. When the first frost zaps your tomato plant, cut it out and let the cabbage and broccoli growing nearby overtake that space. Root crops won’t be as big as spring plantings, but may be tastier. Try growing small, thumb-sized carrot varieties or harvest them young before the ground freezes. 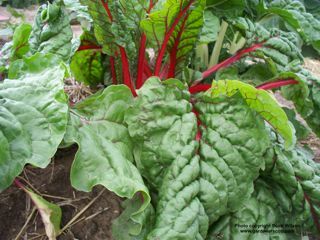 Beet roots will be harvested when they’re just a few inches big, but the beet leaves can be harvested continually. Garden pests can be less of a concern for a fall garden. Many insect pests are less active, if not gone, in fall. The weeds will spend all summer attacking aren’t active in fall. Even deer seem to be scarce as they make their way to find a winter bed. While growing a second crop in the same season sounds like extra work, it doesn’t need to be. Summer garden beds should be cleaned up before winter so insects don’t have a place to overwinter. That clean up works well to prepare the beds for fall crops. You’ll spend a few more days in the garden watering and harvesting, but is that really a bad thing? Fall gardening allows you to do more of what you like and for me that’s a good thing. 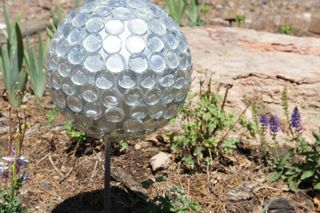 I used to think garden orbs were a little kitschy until I decided to make one myself. Every gardener personalizes their garden in their own way and it seemed like it was time for a garden orb in mine. Gazing balls, garden orbs, gazing globes, and garden balls are all names for a shiny sphere that adds an element of color or reflection to a garden space. They can be made from a number of different materials in a variety of sizes, but for mine I used a bowling ball that I purchased from a local secondhand store. The first step is cleaning the ball. 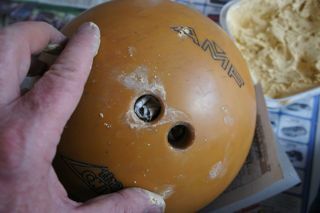 I used isopropyl alcohol to remove years of bowling alley oil and palm sweat from the ball. Second, the finger holes and engraved letters need to be filled. I used wood putty. Not all wood putties are the same; some aren’t intended for large holes and will crack when dry. I used a wood putty formulated for filling gaps with minimal shrinking and cracking. You can also use plaster or caulk. You want to leave one hole open for mounting the ball in your garden. I left the thumb hole open because it’s larger than the others and gives more options for mounting. To reduce the amount of putty I needed, I filled each finger hole with rolled newspaper first. This left a depth of about 1/4 inch to fill rather than the original two-inch hole. You may need to do this in a couple steps. Fill most of the hole, let it dry and then add a final fill. After the putty dried I sanded it. The idea is to have the filled hole flush with the exterior curve. 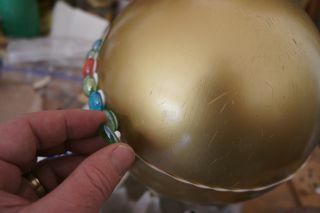 After driving a length of rebar into the ground I set the thumb hole on it and began painting the ball. 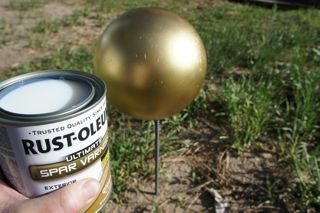 Be sure to choose an exterior paint because the orb will probably be exposed to weather outside. 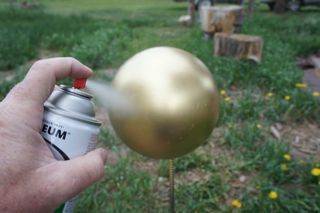 For this ball I selected a metallic gold paint. For extra weather protection you can cover the ball with polyurethane after the paint dries. You need to use spar varnish that is specifically formulated for exterior use. Simply brush it on the entire ball. 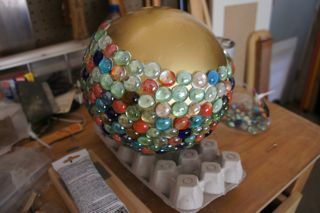 At this point you can consider the project finished and display your shiny, colored ball. 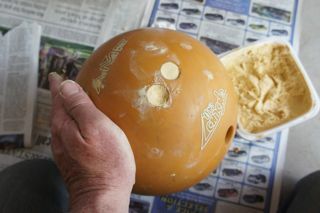 My problem is that many used bowling balls have gouges and scrapes that detract from the smooth, shiny surface I desired. 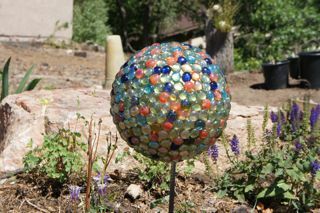 For this gazing ball I opted to add color and texture with the addition of colored glass stones from a craft store. 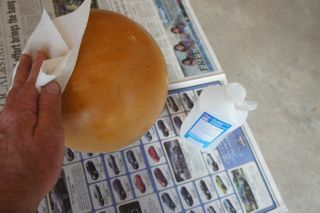 Using a clear, exterior grade caulk, glue the glass stones to the ball. It just takes a dollop of caulk. Press the stone to the ball firmly. The weight of the glass will cause it to slide down the curved surface if you don’t hold it in place for many minutes. I found that a large rubber band placed around the middle of the ball not only marked a straight line, but also helped hold the stones, reduced their slide, and didn’t require me to waste time applying continual pressure. You’ll need to let the first layer set up and dry before moving on. The weight of more than one row will be too much for the rubber band and many pieces will drop off, but with the first row intact it provides an anchor for successive layers. After a few hours of allowing the caulk to set it should be strong enough. Continue adding rows of stones. I found it best to do two or three rows at a time and let the caulk set before moving on with more rows. 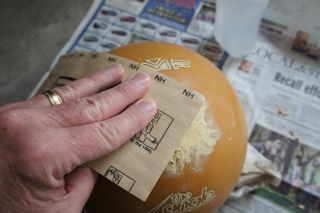 After the upper half is dry, turn the ball over and finish the second hemisphere. I used an egg carton to support the ball while I was working but a large bowl, pan, or wood template would work too. This project took about four days to complete with me completing layers periodically through the day. When the entire ball has had a few days to dry completely it’s ready to place outside. Rebar is an easy mounting rod. Galvanized pipes can be used and can be painted to match the ball. Copper pipe adds a nice touch and brings an eclectic look when is develops a patina. Their is no limit to the colors and designs that you can use to make gazing balls. After the gold ball with colored glass I made a silver one with clear glass stones. Next I’ll break up an old mirror and grout the edges after mounting the pieces to the ball. It will be a truly reflective orb. With a little imagination, a bowling ball, and minimal crafting skill, you can have a gazing ball of your own. Tomatoes are the number one home garden crop in the United States. As a result, tomatoes are the home crop that can cause the most trouble for gardeners; something is always wrong with our tomatoes. We all want the perfect tomato, but getting it to harvest can be troublesome. Here are a few tips to help you get the most from your tomato crop by understanding more about this wonderful red (or orange, purple, yellow, or green) orb. 1. Tomatoes are either determinate or indeterminate. Not all tomato plants are the same so it’s important to know what kind you’re growing. Determinate tomatoes are also called bush tomatoes. They seldom grow more than three or four feet tall and often don’t require any additional staking or support. All of the fruit reaches maturity at about the same time so the harvest will only last over a period of a few weeks. If your plant suddenly stops producing flowers and fruit, even when everything else is perfect, it’s probably a determinate variety. Indeterminate tomatoes may also be called vining tomatoes and can grow as much as eight feet tall. They don’t produce fruit all at once but rather they provide fewer fruit at any one time, but over a longer period of time. Indeterminate tomatoes will usually give you a harvest until the first frost in fall. How you grow these different types of tomato can impact how successful you are. 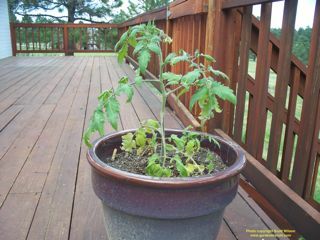 For container gardening, like in pots on a patio, determinate tomatoes are the way to go; indeterminate ones can quickly overrun your space. If you like to “put up” tomatoes in quart jars or as tomato sauce, determinate plants will provide a harvest that you can can right away. If you like to have a few tomatoes to enjoy with your meals throughout the summer, indeterminate is the way to go. 2. Select the best heirloom or hybrid tomatoes for your garden. Many gardeners believe heirloom tomatoes taste better than hybrids. That can be a matter of personal preference, but there are other obvious differences between the two. Typically, heirloom tomatoes have more problems with diseases and pests; hybrids have been developed to overcome these limitations. Heirloom tomatoes tend to take a long time to reach maturity and harvest; hybrids can be selected with very short “days to harvest”. If you have a garden in an area susceptible to tomato diseases, you may want to select a hybrid tomato with letters after its name (like VFN); the letters identify resistance to disease. 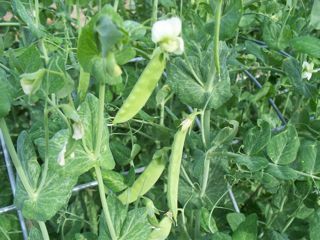 If you garden with a short growing season, you can select hybrid varieties that will ripen early. Hybrids tend to follow a pattern of red, round fruit. If you want to grow purple, orange, yellow, or striped tomatoes, you’ll probably want to look for unique heirlooms. Determine what you want in a tomato and then find the variety that fits, whether its heirloom or hybrid. 3. “Days to Maturity” and “Days to Harvest” are important. Seed packets or plant tags should give you an idea of how long it takes the plant to reach harvest. That is the number of days from the time you put the transplant in your garden, not the time from when the seed was placed in soil. Even a robust plant from a nursery can take more than two months to provide fruit. If you garden in a region with late springs and early falls, you may only have about four months to adequately grow tomatoes (my season is about 134 days). If you select an heirloom plant that takes 120 days to harvest, there will only be a few weeks for harvest before the first frost and if it’s an indeterminate plant there will still be many unripe fruits on the vine when cold hits. Match the plant with your garden for best results. A tomato that takes “80 days to harvest” can provide fruit for two months more than an heirloom beefsteak tomato. Of course, if you have a very long growing season your choices are virtually endless. 4. Tomatoes need sun and air. Selecting the proper location for your tomatoes can make the difference between healthy plants and sickly ones. Tomatoes need full sun; that means at least 10 hours a day and more is better. Even a little afternoon shade can have a big impact on plant growth and harvest. Of all your garden plants, tomatoes should have the sunniest spot. Many of the disease, virus, and fungal problems that plague tomatoes can be corrected by increasing airflow around the plants. Don’t plant too close to other plants. With air circulation the leaves can dry out and not fall prey to the diseases that require moist conditions. 5. Garden soil needs to be warm to plant. 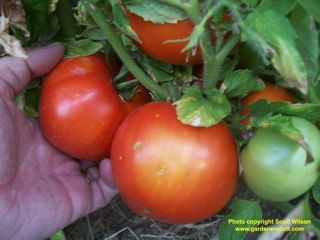 Tomatoes are a warm season plant and need warm soil and warm nights to begin growing. If planted too early, the plants can be stunted and even killed by cold soil temperatures. Some gardeners recommend planting when the air temperature remains above 50F degrees (10C), but that may be troublesome because the soil temperature at root level, six inches and more, can still be below that. Research has found that the best soil temperature is 70F; tomato roots will not grow at all below 50F. I recommend waiting a few weeks after your last frost date to put in transplants. I also suggest using a temperature probe in your soil. Wait until the soil is closer to 60F to plant; at least 55F. 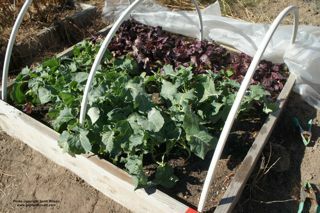 You can accelerate soil warming by covering your garden bed with a plastic sheet for a few days before you plan to dig. 6. Well-drained soil is nice, but amended is better. Tomatoes do best in amended soil. A well-drained soil is nice to avoid pooling water, but if the water drains too quickly the plant and fruit can suffer. Tomatoes will grow in clay soils as long as they don’t remain soggy. The best way to correct poor soil is with organic amendments like compost. A loose, healthy, amended soil will grow bigger and better tomato plants. 7. Pinch off flowers and fruit when you plant. Many gardeners select young plants with flowers or small fruit on them when looking for tomatoes in the belief they’ll get fruit faster; nurseries grow and price them accordingly to entice you. You can actually delay the development of future fruit by choosing a too-mature plant for your garden. 8. Bury the plant when planting. 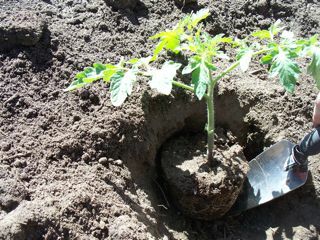 Tomatoes can grow roots along the stem and you should use that ability to your advantage. More roots tend to make for a stronger plant. Placing the plant in the soil with more stem buried than in the original pot will ultimately provide better results. Pinch off lower leaves next to the stem, leaving the top four to eight groups of leaves at the top. If you have amended soil in a region with steady rain, place the plant vertically in a deep hole with only the leaves above the surface. For poorer soil and in regions where your irrigation may be the only water source, place the plant in a slanted trench so that the stem is horizontal; you can gently bend the top towards vertical and hold it in place with a small soil berm. 9. Tomatoes don’t need as much water as you think. Consistent moisture levels are more important than amount of water. Many gardeners think of tomatoes as tropical plants that need watering every day. Diseases, blossom end rot, and cracked skins can be the result of poor and inconsistent watering practices. Frequent, light watering can result in poor root systems. Tomato soil should be moist all the time, but not wet or soggy; think of the moistness of a wrung-out sponge. With amended soil you may only need to water every three of four days. Of course, very hot and dry conditions will require more watering, but physically check the moisture level of the soil before assuming more is needed. 10. Overhead watering can encourage disease problems. When you water, try to avoid sprinklers or hand watering from above. Almost all of the diseases that affect tomatoes are soil borne. The fungal spores and bacteria are just waiting for a way to reach low leaves and splashing water is the perfect mechanism. Even a drop of water falling from a lower leaf can release these tiny organisms from the soil surface and infect the plant. 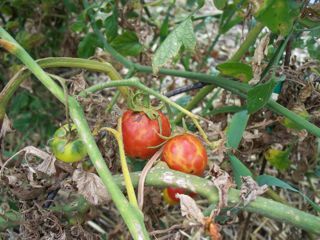 Drip irrigation and soaker hoses can drastically reduce tomato diseases. These watering methods get water directly to the roots without any of the nasty side effects of overhead watering. 11. Mulch can help produce perfect fruit. Mulching with a light, organic material can reduce the problems with soil and watering. Mulch helps to maintain a more consistent soil moisture level. Mulch also acts as a protective barrier so any water falling off the plant hits mulch and won’t release soil-borne pathogens. I like to use straw or herbicide-free grass clippings for tomato mulch. The light material allows air and water to reach the soil while helping to keep soil temperature and moisture more consistent. It will also decompose and amend the soil for the next season when I till it in at the end of the year. 12. Fertilizer may hurt your harvest. Proper fertilization is critical to getting a harvest and improper fertilization may result in no harvest at all. With rich, amended soil you may not need any additional fertilizer. If you do fertilize, you need to do it differently at different times. As mentioned above, root development is important for young plants. Adding a fertilizer high in phosphorus to the soil at planting can help in that development. As the plant grows and nears fruiting, a potassium fertilizer will help in fruit development. The problem most gardeners encounter when fertilizing tomatoes is by using a fertilizer high in nitrogen. Nitrogen encourages big, bushy plant growth at the expense of flowers and fruit. If you fertilize and get a beautiful plant with no fruit, this is probably your problem. Look for a fertilizer with higher numbers in the second and third position. The numbers on a bag or box of fertilizer represents the percentage of nitrogen-phosphorus-potassium (N-P-K). A higher first number will spell doom for your harvest. You’ll find specialized tomato fertilizers with ratios of 3-4-6, or 5-6-5, or 4-7-10, or 18-18-21. Note that the first number (nitrogen) is never the highest. In my opinion, better tomato fertilizers would be 15-30-15, or 6-24-24, or 8-32-16. 13. Heat can reduce harvest. If days and nights get too hot, tomatoes will drop blossoms and no fruit will form. Tomatoes grow best when the temperatures are between 70F and 90F degrees. When day temperatures are above 95F, or night temperatures remain above 75F, fruit won’t develop. You can take every step above, but if it’s too hot in your garden you won’t get any tomatoes. 14. Pinching suckers may not always be the best idea. 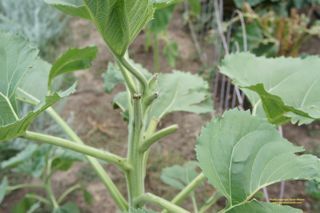 Many gardening “experts” say to pinch off all suckers that develop in the crook between the main stem and branches. While this won’t hurt the plant, it may not be as necessary as proposed. The key is knowing whether the plant is determinate or indeterminate. Indeterminate tomato plants can get very big. Pinching the suckers can focus growth where you want it so the plant doesn’t become too cumbersome while focusing plant energy for developing large fruit along main branches. Leaving the suckers on the plants will produce more foliage and potentially smaller fruit. Because the fruit is produced over a longer period, allowing it time and energy to grow big may be beneficial. Fewer, bigger fruits can be a good thing. Determinate tomato plants don’t require any pruning and removing suckers can actually reduce harvest. Tomatoes can develop on the branches that grow from the suckers. Because a determinate plant produces all of its fruit at the same time, more branches and more flowers means more fruit. For many gardeners wanting to preserve their tomatoes, more may be better than bigger. 15. Use a strong trellis. 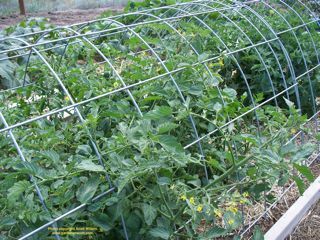 There are many options for trellising tomatoes and it’s worth spending the time and money for a sturdy one. While a single metal rod or flimsy wire cage will support a young plant, a mature indeterminate plant loaded with fruit will soon flop to the ground, damaging fruit and exposing the plant to all of those disease-causing soil pathogens. I like to use heavy-gauge steel cattle panels to form a curved trellis over the entire bed. Home improvement centers sell steel lattice panels used for reinforcing concrete; these can be cut and bent into strong towers to support tomato plants. 4 x 4 wood posts set in the ground can be used to train vines on strong wire strung between them. Whatever you use, ensure it can handle the weight of a big plant. 16. Rotate the location of your tomatoes. As mentioned earlier, the pathogens affecting tomatoes reside in the soil. Once a plant is infected the soil is infected. Continuing to grow tomatoes in that same location the next year means that those new plants are very likely to be infected. If your garden space allows, it is best to avoid planting tomatoes in the same bed as recent tomatoes. Time will dissipate the pathogens’ viability. Wait at least three years between plantings in the same bed. Ideally, wait at least seven years between plantings. The more you can rotate with longer periods between, the less likely you are to encounter the same diseases. 17. Harvest before the fruit is overripe. Tomatoes should be harvested when they’re ripe but before they soften. Left too long on the vine, tomatoes can become mushy and bland. Green tomatoes can continue to ripen after they’re picked. For that reason it’s better to pick a little early rather than a little late. The fruit may crack or develop circular rings near the stem when they’ve been left on the plant too long. Because the fruit often grows in clusters, you can use these signs on one fruit as a signal to harvest nearby fruit. As indicated by these tips, tomatoes can be a finicky crop. A little too much water, a little too much heat, and a little too much fertilizer will affect your crop. I grow in a very challenging environment and I regularly meet gardeners unwilling to try tomatoes again after a disappointing season or two. It can be a challenge, but there’s a reason tomatoes are the number one home garden crop. When you do it right, few other garden crops can be so satisfying.